Tripp Lite Standard Computer Power Extension Cord, 13A, 16AWG (IEC-320-C14 to IEC-320-C13), 3-ft. Standard Computer Power Extension Cord, 13A, 16AWG (IEC-320-C14 to IEC-320-C13), 3-ft.
Tripp Lite's line of AC power cords offer PC users a solution to their power connectivity problems. 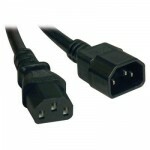 This handy 0.91 m (3-ft.) cord can be used to extend the power cord on any PC or device with a C14 plug; or, to connect your C14 PC or device directly to the C13 port on your PDU or UPS. Features an IEC-320-C14 to IEC-320-C13 connection. UL listed.